Joan Miró is the artist of the sculpture Monument a la dona (1972), reputedly the work of art most often photographed by tourists visiting Palma de Mallorca. The public has given the Monument to the Woman a nickname, though: the Egg. It’s easy to see why that should be so. 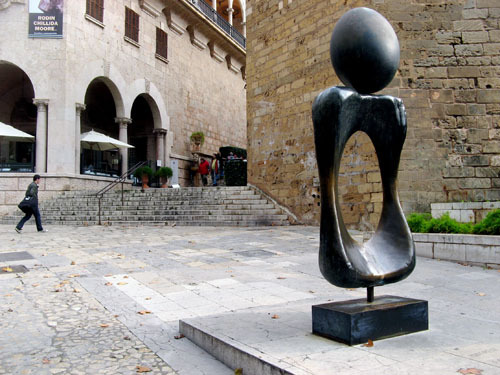 The city of Palma de Mallorca is the custodian of the artist’s Mallorcan legacy. You can visit the Fundació Pilar i Joan Miró a Mallorca in Palma’s suburb, Cala Major, in Calle Joan de Saridakis, 29 (just beyond Porto Pi). Opening hours during the Winter season are Tuesday to Saturday, 10h00 to 18h00, and Sunday 10h00 to 15h00. Admission fees are 5 € for the general public, or 1,80 € for Palma residents. The photo was taken in Palma de Mallorca, Spain. The date: January 11th, 2008. The time was 13:35:40.
awsome dude, thats pretty sick man. good photo too.